Edwin Shorthouse was a marvelous singer and always received rave reviews for each opera in which he sang. However, Shorthouse was a very annoying person to work with, and his attitude and actions toward women would certainly end his career in 2018. Adam Langley was a tenor who was performing in Die Meistersinger with Shorthouse in Oxford. Adam was married to Elizabeth who was a writer for magazines and was currently working on an article on famous detectives. She was hoping that while they were in Oxford that she would be able to interview Gevaise Fen who was known for his detecting skills. She said that she was hoping to interview "H.M, and Mrs. Bradley, and Albert Campion and all sorts of famous people". The rehearsals for Meistersinger were not going well. The conductor, George Peacock, was young and not very experienced. Shorthouse set out to get Peacock removed from the conductor's position. Shorthouse interrupted him during rehearsals, made annoying and pointless demands, and Peacock became more and more upset at each rehearsal. Then one evening, Shorthouse was foung hanging from a hook in the ceiling of his dressing room. Murder or suicide? The police in the person of Sir Richard Freeman, the Chief Constable arrived at the theatre. He was accompanied by Gervaise Fen, a professor of literature at Oxford. They examined the dressing room in which Shorthouse had been found hanging and determined that to hang him in this room was very difficul. Fen met many people in the cast of the opera. There was no shortage of people who would have like to kill Shorthouse either because of obnoxious personality or his inability to keep his hands off the women in the cast. Another murder occurred and an attack was made on Adam Langley. Fen, of course, found the murderer and explained how the murders were committed. These methods are very complicated in the best tradition of Golden Age mysteries. I think that this book will appeal to fans of opera as well as the reader who enjoys a bit of humor in his mystery novels. 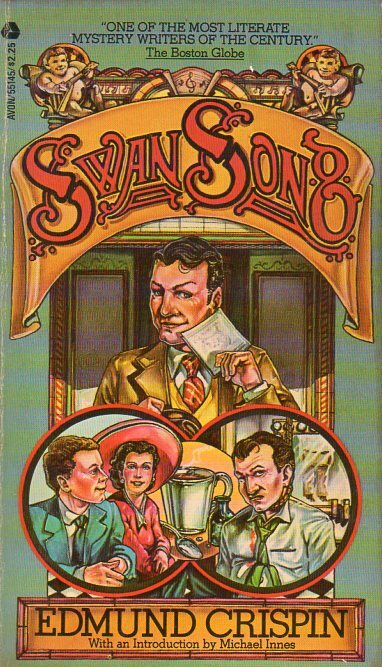 Edmund Crispin writes charming and literate novels which I have always found to be quite enjoyable. This book was published in 1947. 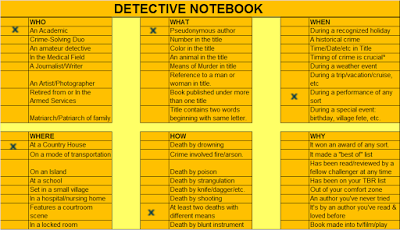 In my Just the Facts, Ma'am Detective Notebook, it is in the category of Who - an academic.